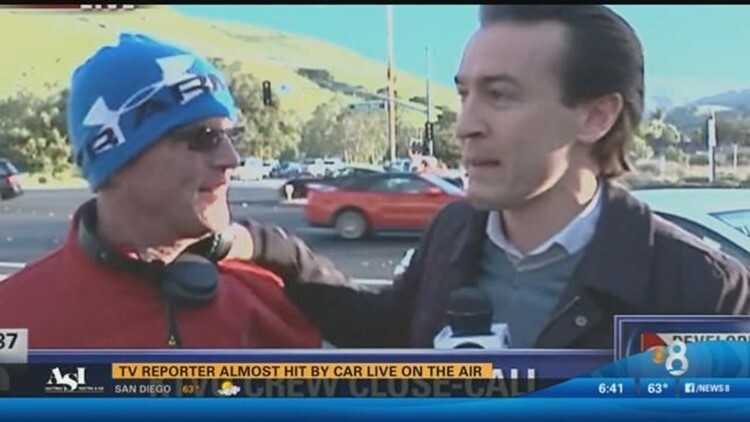 A Northern California television reporter and cameraman narrowly missed getting hit by a car while reporting on air. ALAMEDA COUNTY, Calif. (AP) - A Northern California television reporter and cameraman narrowly missed getting hit by a car while reporting on air. KTVU's Twitter feed on Tuesday showed a clip of reporter Alex Savidge on air before there's a loud bang and cameraman Chip Vaughan hollers at him to watch out. The reporter jumped out of the way just as a white car plowed into the spot where he was standing. The reporter is heard saying that they're OK. Savidge posted on his Twitter feed that his heart was racing, but he was all right. KTVU reports (http://bit.ly/1M4LUDt ) that the men were standing in a parking lot by a busy street when the car crashed and careened toward them. They were reporting on a commuter train derailment that injured nine people Monday night.